A spokeswoman says the aircraft involved at the weekend, hadn't been used on that route before, and didn't have the necessary clearance. The airline provided for accommodation and meal vouchers for passengers who needed them as a result of the delay. 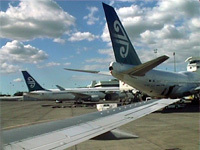 It also gave each passenger a 200 dollar voucher to spend at Auckland Airport.